When you are ready to get started fly fishing, let us show you the ropes with a Colorado fly fishing lesson. There are many benefits in having expert fly fishing instruction, whether getting into the sport yourself or introducing a friend or a loved one to Colorado fly fishing. Lots of bad habits can be avoided, the learning curve is extremely high, the frustration of untangling and rigging is avoided, (plus you learn how to do it yourself) and it is always more fun for beginners when they have had many opportunities to learn and to hook some trout. We take pride in bringing our clients expert fly fishing instruction on casting, knots, entomology, gear selection, reading the water, spotting fish, fly selection, and lessons on fighting the trout. Regardless of whether you are out fly fishing for the first time or want a Colorado fly fishing lesson to brush up, our instructors are all very patient and will get you going in the right direction, so come give fly fishing a try! We also offer more specialized Colorado fly fishing classes. Choose from a variety of options from entomology to fly tying. 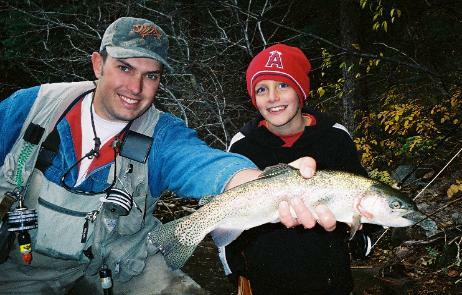 These Denver fly fishing classes and instructional lessons are a great way to expand and hone your fly fishing skills. 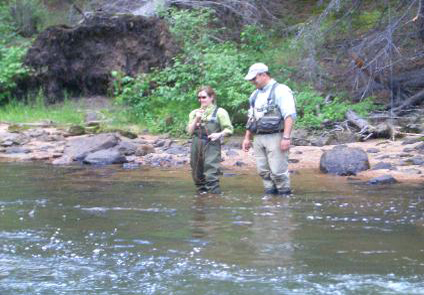 All of our fly fishing lessons and instructional days are conducted on the water with an experienced instructor. Location depends on where the fishing is best. Even though the emphasis is on learning, it is nice to be able to get into some fish! Cost for lessons and instructional days is identical to our guided trip rates. Call 303-325-5515 to book your Colorado fly fishing lesson today! First Colorado trout caught on a Colorado Trout Hunters Denver fly fishing lesson. 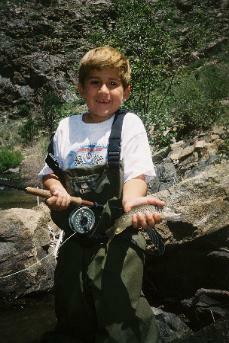 When gearing up for your Colorado fly fishing lesson check out Trout Hunters customized gear list at Pro Guide Direct. First Colorado trout on a Denver fly fishing lesson. Expert Colorado fly fishing instruction on the South Platte River near Denver.